3 Info Display: it provides the most important information of the selected clip and cannot be edited. It contains two different view parameters: one for the Digital Image Technician and another one with relevant information for the Data Wrangler. 4 Switch between View modes like Summary, Table, Collection, Playback. Collection view (figure 2 #2): it gives you a visual overview over the clips in your library. 5 Navigation through your Projects, Jobs, Volumes. Folders and Bins with bread crumbs. This feature is specially useful when you hide your library view and clip information view. Seal: seal drives for subsequent workflow steps. Export: export metadata files to use in editorial and post production. Import: import metadata and match it to the clips from different sources. Transcode: create derivates from your clips in a more manageable format. 7 Clip information for supported advanced camera formats. 8 Jobs panel: Job or Copy Status, like successful or failed copy jobs, duration and file destination. More information in the article Managing Jobs. 9 Toggle View Controls to hide or show the Library panel, the Grading Controls, Audio Controls panel and the Clip Info panel to have more work space for example on small laptop screens. 10 Work spaces such as Manage, QC, Color and Config to speed up specific tasks. 12 Project Library selection switcher. It displays the name of the current project. 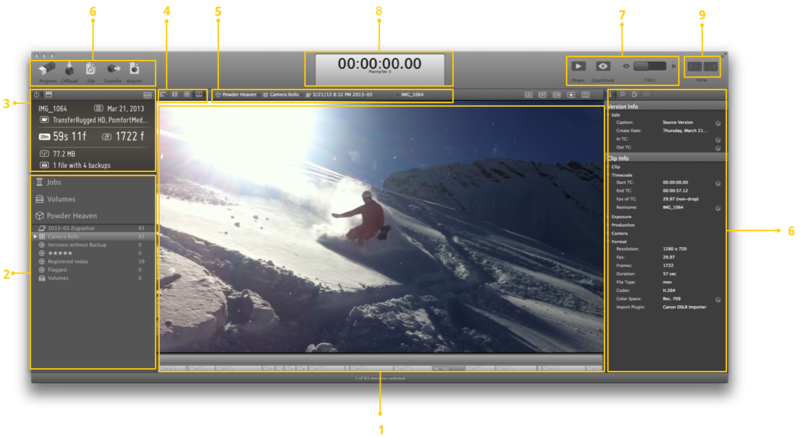 13 Toggle between Clip information, User Information, File Resources, Clip Header, Look Library and Transcoding configurations. 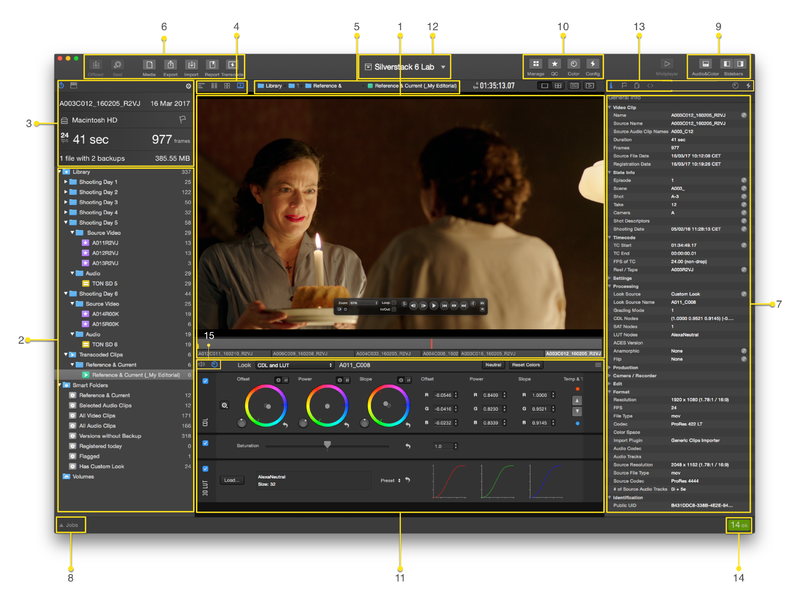 15 Switch between the audio and the grading panel in the lower “Audio&Color” section. 1 Indicates the number of connected storage devices concerning this clip’s storage locations. The number colored in red shows the number of missing sources. 2 The clip name and duration. If the clip has been labeled, this part is colored. 3 Indicates that this clip is marked with a flag and can be searched and filtered for this criterion. 4 Description of the ingest date and time.